Like the DP4801 ATEX two-way radio itself, the DP4801 ATEX battery is ATEX-certified for use in mines and other environments with gas and dust. 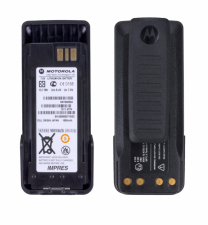 The battery powers the Motorola DP4801 ATEX for up to 16 hours. Handheld two-way radios need to be reliable in hazardous environments, of course - but so do their batteries, because dependable communication in those areas is an absolute must for maintaining employee safety. This dependable genuine battery is easy to replace, even with thick safety gloves on, and it guarantees long-lasting power for your radio. To ensure consistent communication, use the battery whenever you notice a decline in a handheld two-way radio's performance. Rent the right batteries for our Motorola DP4801 ATEX online now, using our online quote-request tool. Simply click on the "Request Rental Quote" button. We'll gather all the information we need for your quote in three simple steps. You can then go on to add two-way radios and headsets and get a quote online.